Meetings are a type of Virus that use humans as hosts to replicate…..
Have you ever gone to a meeting where you have no idea why you are there? At the meeting people speak your language, but use words and expressions you don’t recognise? Throughout the meeting some people speak, just for the ‘joy of hearing their own voices’? If you have answered yes to all of those questions, the only logical conclusion must be that there are factors beyond rational human control that have caused the meeting to happen. Something we cannot quite control through the power of efficient business processes and synchronised Outlook calendars. The Dilbert suggestion that meetings are a viral life-form doesn’t seem so strange now……. does it? It’s Open Season on Meetings. Just to get serious, everyone seems to have turned their sights on meetings at the moment. I’m just as guilty and I’ve written a few posts about meetings (available here) where I’ve put the point across that, despite the problems, meetings are very valuable part of doing business. Face to face contact is invaluable in helping to develop relationships and build trust, and sometimes meeting face to face is the only way to get agreement over difficult issues. But that doesn’t count for every meeting. Just to prove it’s a serious ‘grown up’ issue, the Harvard Business Review (HBR) have produced ‘All the Charts, Tables and Checklists You Need to Conduct Better Meetings’. Despite the 1st April publication date, this is a good summary of the things you need to consider, it is worth looking at. You might have seen this ‘Should I Hold A Meeting’ decision tree from the HBR Article which circulated widely on Twitter (thanks to Paul Taylor where I first saw it). Virus Control in Meetings. In the spirit of meetings being viral life-form, I thought it would useful to apply some anti-viral techniques for keeping them under control. So here goes with; avoiding infection; escaping the Infection zone and slowing down virus replication. Avoiding Infection – this is easy, just don’t go to any meeting that doesn’t look useful. Obviously this is easier said than done, especially where some organisations enforce ‘mandatory’ meetings. However it is worth persevering, the HBR checklist is useful, particularly when you have the power to call the meeting. Just think of taking the decision to not call the meeting as the metaphorical equivalent of a good dose of extra strength hand sanitizer. A bit tingly, but worth the effort. Escaping the Infection Zone – this particularly applies to the meetings where you are at the mercy of someone else. The longer you stay in the ‘zone’, the more likely you are to become infected with the ‘meeting virus contagion’. You can use multiple excuses to escape and ‘slip away’ for a while. Urgent telephone calls are a favourite, so are lavatory breaks. People will generally be too polite to ask why you’ve been away for ages, and its also a chance to use the hand sanitizer. Slowing down replication – only one thing to say here, SABOTAGE. 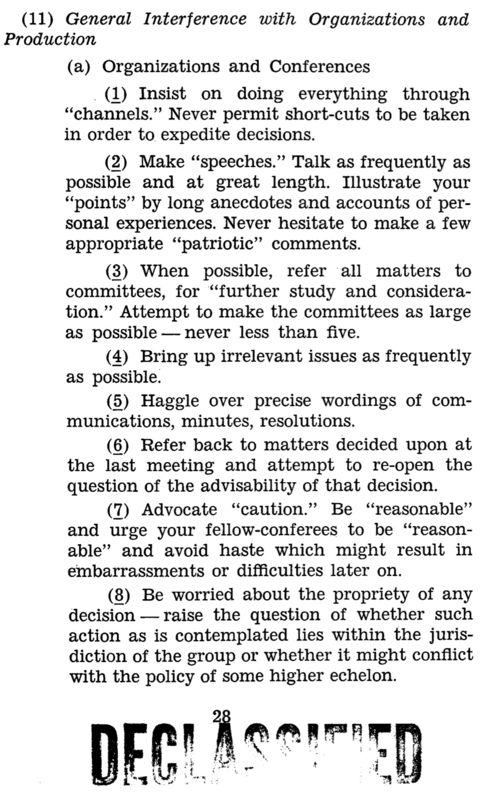 If you become a complete meeting nuisance, in a non-specific sort of way, there’s a good chance you won’t be asked back. There are a few approaches you can take, asking awkward questions is always good, but can be counter-productive. You don’t want to be routinely brought in as the ‘critical friend’ or ‘voice of reason’. Be boring – It’s a definite ‘anti-viral’ meeting killer and might get you permanently excluded. If you want some more detail have a read of ‘A Guide to Boring’ from Helen Reynolds. The Field Sabotage Guide. The Simple Sabotage Field Manual is a practical guide to basic, but effective meeting sabotage. Produced in 1944 by a predecessor organisation to the CIA it was declassified recently and is applicable 70 years on as it was on the day it was written. You might recognise some of the behaviours from meetings you’ve attended. I have written about it previously (Spotting Field Sabotage), and the picture below clearly explains what you need to do. Meetings can be a highly effective way of building relationships, developing trust and getting things done. Always ask why do you need this meeting? Use things like the HBR ‘charts and checklist’, but if all else fails you could use sabotage to slow down the replication of the meetings viral life-form. If the meeting can start without you, then you don’t really need to be there! Sneak off an get a nice coffee instead! The ‘If/Then’ Test should be an MBA text book standard. I’ve had some of my best ‘meetings’ by not going to meetings. During the time I’ve not gone into the room, or escaped for an imaginary toilet/phone-call break I’ve bumped into all sorts of interesting people. I’m sure someone has written something about that Brazilian company that has no management and people only turn up at meetings if they think they will be worth while. If nobody turns up, the meeting wasn’t worth having…. a bit of the un-conference approach I suppose. Just noting my share of this earlier has had over 100 retweets! Indeed whenever I blog or comment about meetings they are consistently my most shared social media posts. So – if everyone recognises the problem – why can’t we find a solution? You’ve outlined the virality of meetings exceptionally well but you also made a comment on Twitter that I thought relevant – do we secretly like them? What he found though is that people would still call meetings. They would still travel to them over long distances even though technology had made that redundant. He reasoned that people were locked into a pattern of being summoned and attending meetings – and some of this was about appearing busy. Additionally people had a fear of missing out. His only solution to stopping meetings? Refusing to pay travel expenses. This is a great stream of posts but I’m not sure our behaviour shows any time of changing soon. First things first, thanks for sharing the post, it’s had far more views than anything I normally write. As you say, the ‘problem’ with meetings is obvious to all, but something that nobody seems to want to do much about. It’s a complex problem that is wrapped up in all sorts of things linked to; human behaviour, cultural traditions, social norms, power hierarchies, resistance to change and doing what’s comfortable. I know of people (mostly in sales) who will spending 8 hours travelling for a 1 hour meeting – but they will justify it with all sorts of reasons around the need to ‘see the whites in people’s eyes’. This is all part of the process of building relationships and developing trust which they feel they need to go through. There is a time and place for meetings, but when they become a default security blanket, they loose their value. I suspect that any change in behaviour that shifts people away from the ‘meetings dependency culture’ will take time, and a variety of methods – a bit like any other sort of behaviour change. I did attend a session recently about Behaviour Change Science delivered by people fromBangor University. One if the things they spoke about was the ‘Architecture of Choice’ as a method of ‘nudging’ behaviour change. I think there might be something in this. If it is a hassle to book meetings and attend them, people might be less inclined to do it – not paying travelling expenses might be something that fits into this category. I could do a follow up post on ‘changing meeting behaviour through the Architecture of Choice’? Just a thought. Blimey, that was a bit of a ramble…. I like the decision tree, but I think there’s something insidious hiding in there. The third question is ‘does it need to be face to face’ and if not, ‘send an email’. This rather relies on the assumption that people read emails and act on them (or, rather, to the documents attached to emails). I have no faith that key people will actually do this, and so the only way to progress is to meet them, to talk about the document that they could have read & commented on via email but they just won’t. (NB, this is not true of all people in my organisation. Just enough of them). ← 5 Monkeys, Bananas, Ladder, Water. Why do we comply with daft rules in organisations?